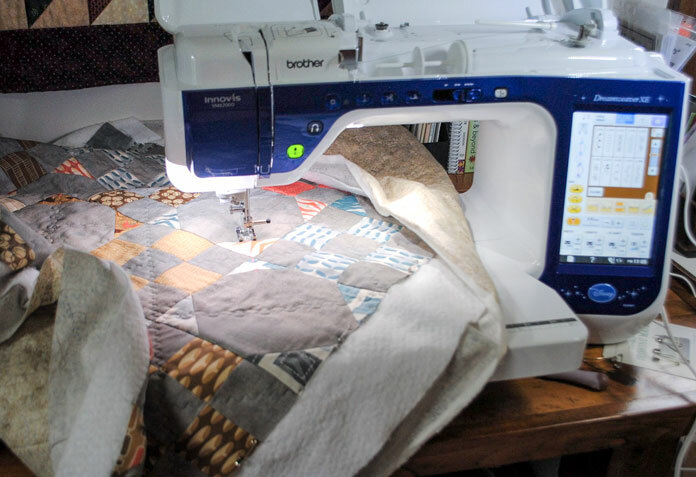 Welcome to, not only another informative week of QUILTsocial posts, but Part 2 of Christine Baker‘s Double Wedding Ring tutorial. 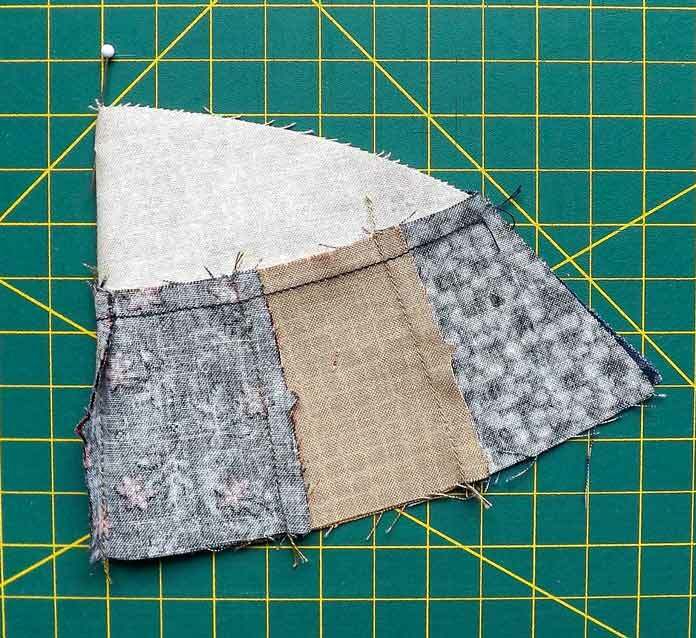 You might remember the first post that started it all in March, The anatomy of a Double Wedding Ring quilt, in which she explained in detail what parts make up this very intricate design. That week held a lot of information to make your own version of this traditional quilt. This week, Christine continues working on her bed runner exploring the capabilities of the Brother Dreamweaver XE. Yesterday on QUILTsocial I used the Dreamweaver XE from Brother to start sewing together some of the pieces of our Double Wedding Ring quilt blocks. So far all of the piecing has been straight seams, just like you would do with most quilt blocks. Today, however, I’ll start sewing some of the curved seams and you’ll see how easy it really can be! Ready? 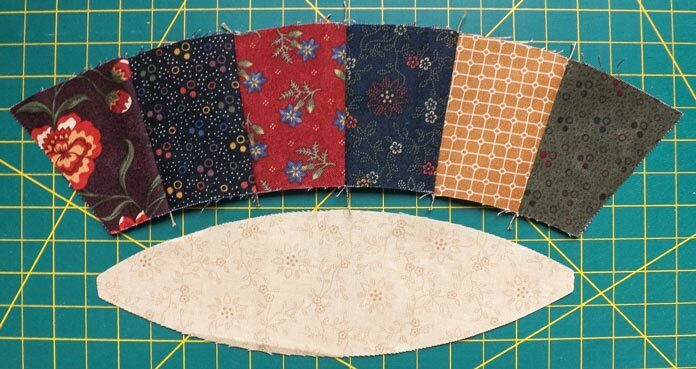 Start by selecting one inside arc and one of the pieced arcs from the pile that was set aside yesterday – it doesn’t have any squares sewn onto the ends. This week on QUILTsocial we’re exploring all things Double Wedding Ring! Yesterday I talked about different ways to cut the pieces for a Double Wedding Ring quilt. I also included a chart for the measurements and number of different pieces required to make this quilt in 7 sizes! Today I’m starting to sew the blocks using the Dreamweaver XE from Brother. 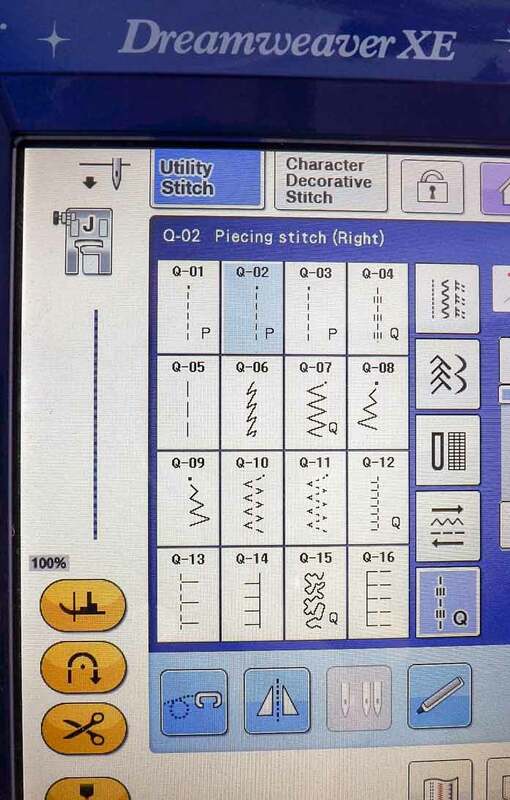 Before I start piecing, I’ll select Stitch Q-02 on the LCD screen of the Dreamweaver XE. Yesterday on QUILTsocial I discussed the anatomy of a Double Wedding Ring quilt and I showed you some different versions of this classic pattern. 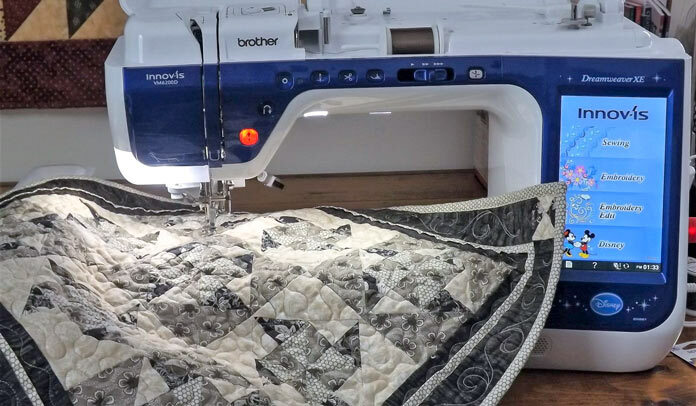 Today I’ll show you the math behind a Double Wedding Ring quilt and the 5 different ways you can cut those differently shaped pieces. 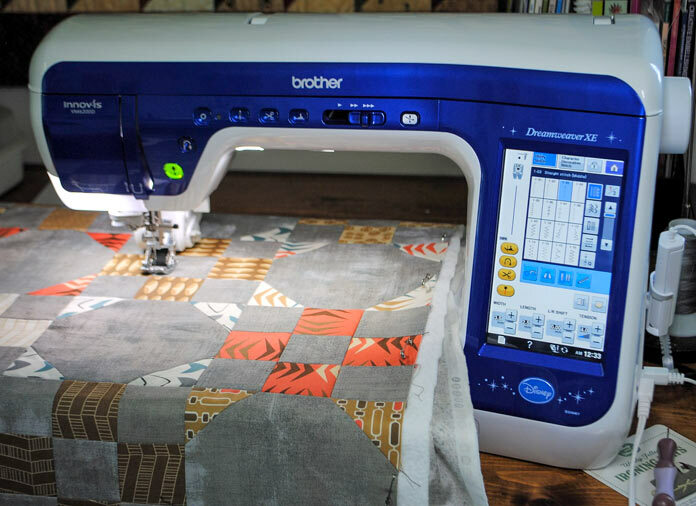 I can’t wait to get all of the pieces cut to get sewing with the Dreamweaver XE from Brother. This week on QUILTsocial I’ll focus on the Double Wedding Ring quilt. Now, if you’re new to quilting you may not know this name, but almost everyone has seen this pattern. The Double Wedding Ring pattern was first published in 1928 and has been a favorite for many quilters ever since then. Since the sewing of this pattern can be quite intense, I’ll spread it out over this week and my week in April. The Dreamweaver XE from Brother has a lot of sewing in front of it – so let’s get started! Consider this week’s posts by Christine Baker as part 1 of a complete tutorial on the Double Wedding Ring quilt pattern. Part 2 will be published in April, and the completed bed runner revealed! To many, the Double Wedding Ring pattern is daunting. 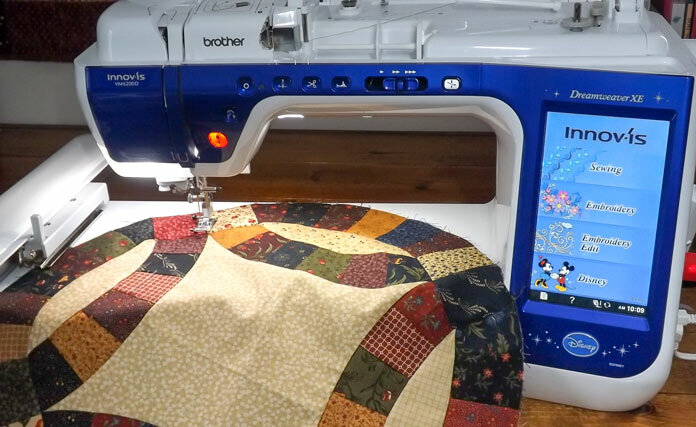 It could be because of the curved piecing and the many differently shaped pieces it takes to make this very romantic quilt pattern. It could also be that these differently shaped pieces need to match up every time for the full effect! Yesterday on QUILTsocial I started a badge design using a machine embroidery design found online. Today I’ll finish designing my badge and stitch it out using the Brother Dreamweaver XE. Yesterday on QUILTsocial we made quilt labels by embroidering words on ribbons. 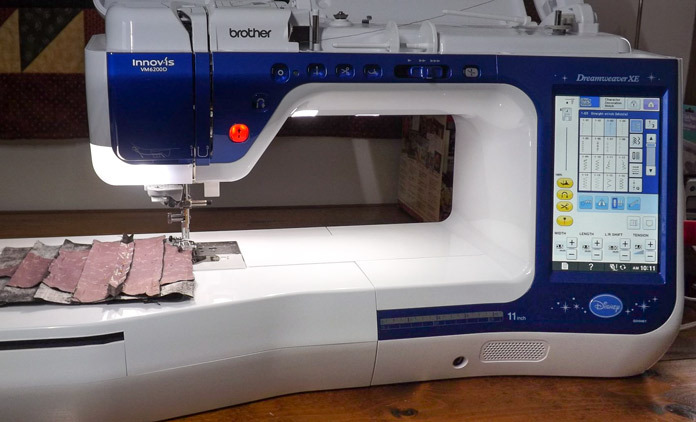 Today, I’ll use the Brother Dreamweaver XE to design a badge that I’ll embroider on felted wool tomorrow. 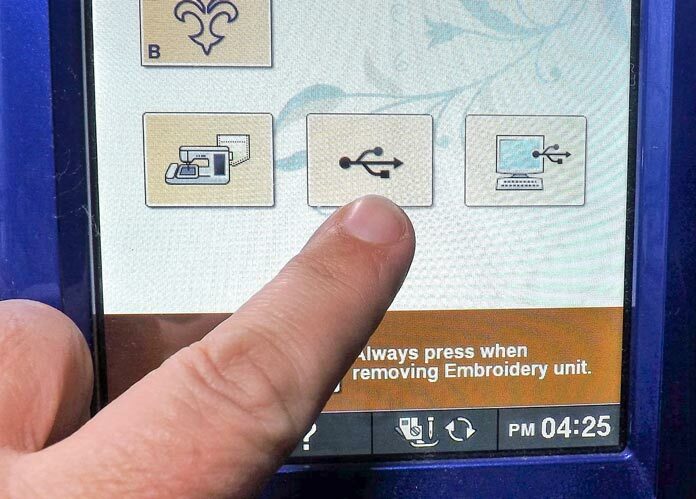 I downloaded an embroidery design for free online and added words and a frame around it, so I first need to select Embroidery Edit on the home screen. After I downloaded the design onto my laptop, I saved it on a USB stick. In order to access it, first I need to press the USB key on the memory screen. Yesterday on QUILTsocial I set up the lettering and fixed the size so that it would fit in my Dreamweaver XE large hoop. Today I’m stitching and I’ll show you how you can easily ensure that your design will fit on your ribbon. Are you following along? For these embroidered ribbons I’m using a 75/11 embroidery needle, so go ahead and change the needle in your machine if you need to. 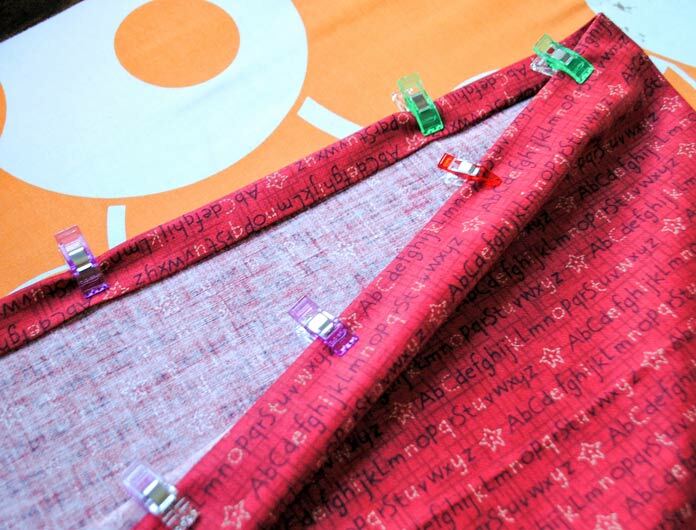 Yesterday on QUILTsocial I talked about 4 easy steps for using Sulky Sticky + self-adhesive stabilizer for embroidering small pieces of ribbon, fabric, caps, etc. that do not fill a hoop. 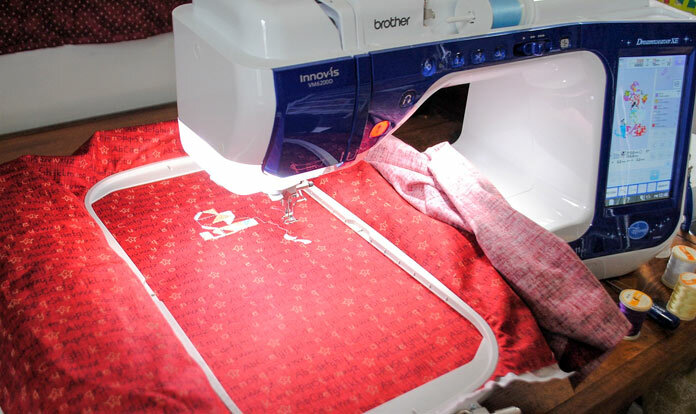 The hoop is locked into the carriage of the Dreamweaver XE from Brother and today I’ll show you how to set up the desired lettering to embroider on the ribbons. The ultimate purpose of the embroidered ribbons is they will be quilt labels. 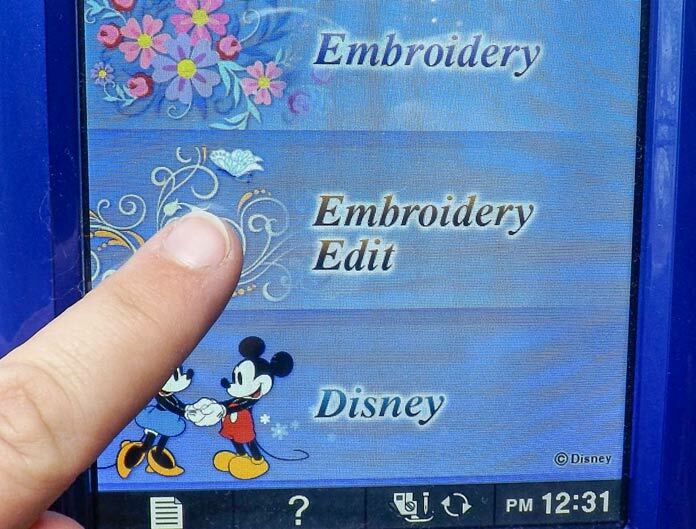 On the home screen, select the Embroidery Edit key. 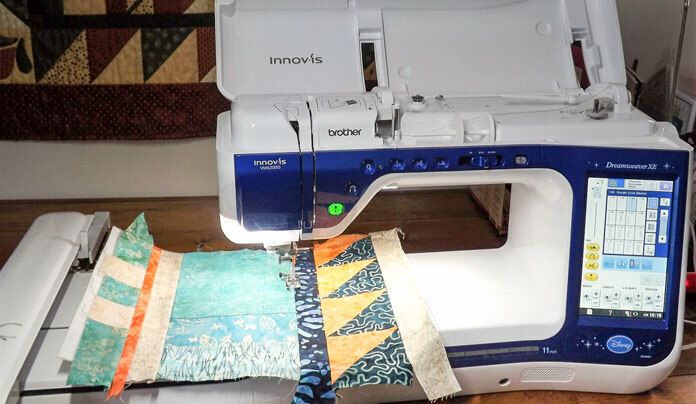 When Carol from Just Let Me Quilt announced there was a new blog hop coming up in February, I did my usual mental dance with myself. Mature Me said “Nope, you’ve got too many more urgent important things on your plate”. Optimist Me said “But I’ll just do something little…. I’ll squeeze it in”. Mature Me said “Pigs might fly!”. And Stick It to Mature Me Me said “Oooooh….. pigs might fly – that’d fit the theme! Hahahahaha”. I have a few machine embroidery designs from Disorderly Threads. Occasionally, they announce a discount on new designs through their Disorderly Threads Facebook page. The Octopus design was one I couldn't resist. 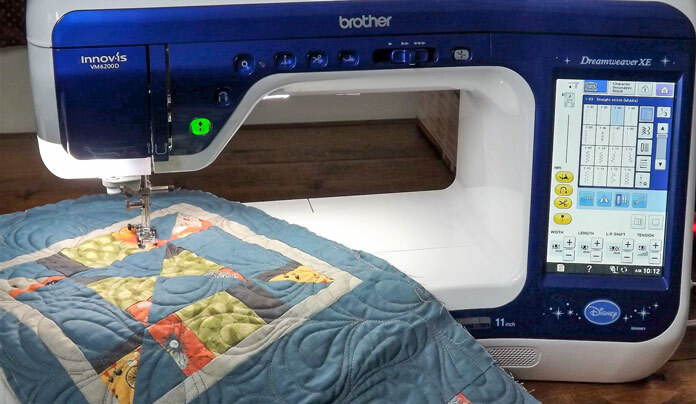 This week on QUILTsocial, I’m using the Brother Dreamweaver XE to do a couple different embroidery techniques that I’ve been wanting to try for a while now. The first technique is embroidering on ribbon and the second is making a badge by doing embroidery on felt or felted wool. February is Mini Quilt Month in the Island Batik Ambassador calendar: “Create a mini quilt 24″ x 24″ or smaller, any technique” is the challenge we’ve been given. Minis are a great way to try a new technique, or explore resource/time intensive projects on a doable scale. Or to commemorate an occasion or holiday. Like the Lunar New Year. For my first 2019 Ambassador challenge I decided to make something to mark Chinese New Year. Happy New Year of the Pig! 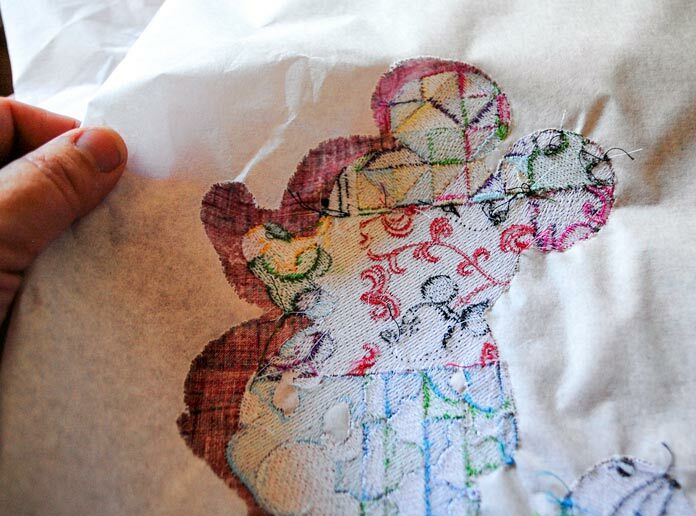 Yesterday on QUILTsocial I used the Dreamweaver XE to sew simple French seams in my embroidered gift bag. Today I’ll finish up the bag by adding a drawstring closure. First it’s necessary to finish the top edge of the gift bag. Fold the top raw edge of the bag over ½” and press. Now, fold the top edge over another ½” to encase the raw edge. Press and then either pin or secure using Wonder Clips and then topstitch close to the inside folded edge. 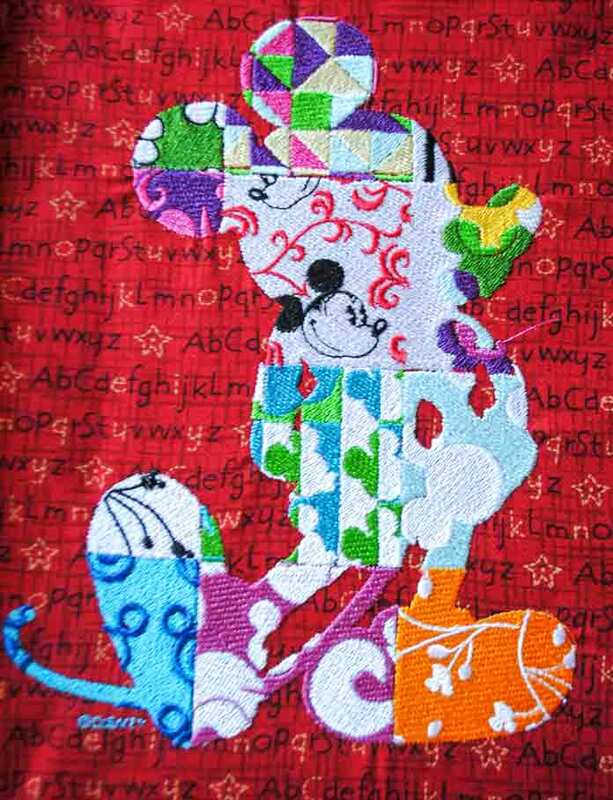 Yesterday I used the Dreamweaver XE to embroider a fun Mickey Mouse design on the fabric that will be used to make a gift bag. 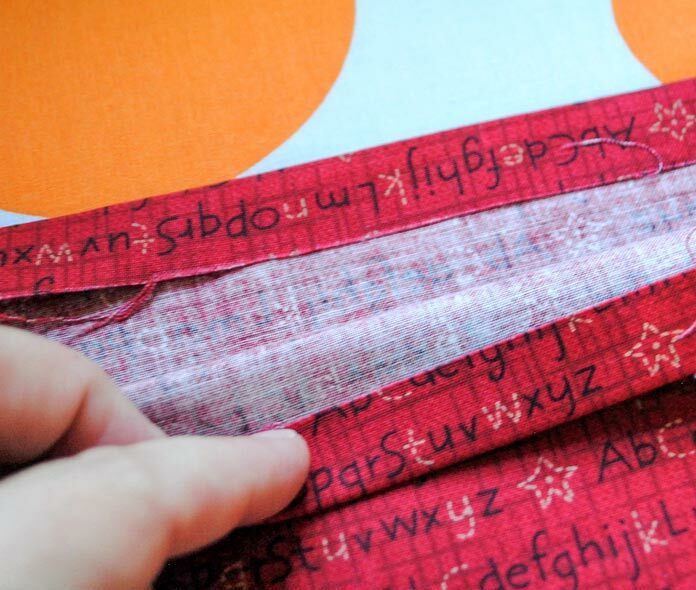 Today I’ll show you how easy it is to make French seams that give the inside of the bag a neat, finished appearance. Here’s the ‘patchwork’ Mickey Mouse design that came pre-loaded on the Brother Dreamweaver XE. 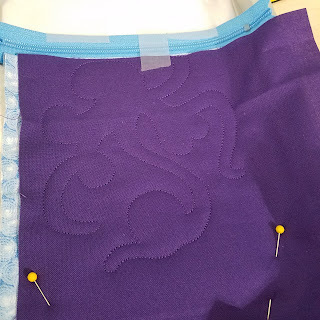 Before sewing the side and bottom seams, I’ll tear away the stabilizer from the back of the embroidery. Yesterday on QUILTsocial I talked about 8 great features on the Brother Dreamweaver XE that make machine embroidery a breeze. 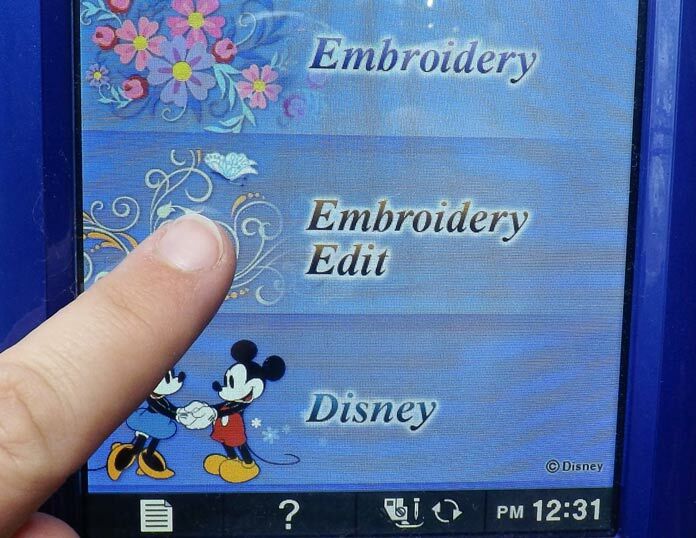 Today I’ll put these features to the test and stitch out an amazing Disney embroidery design. 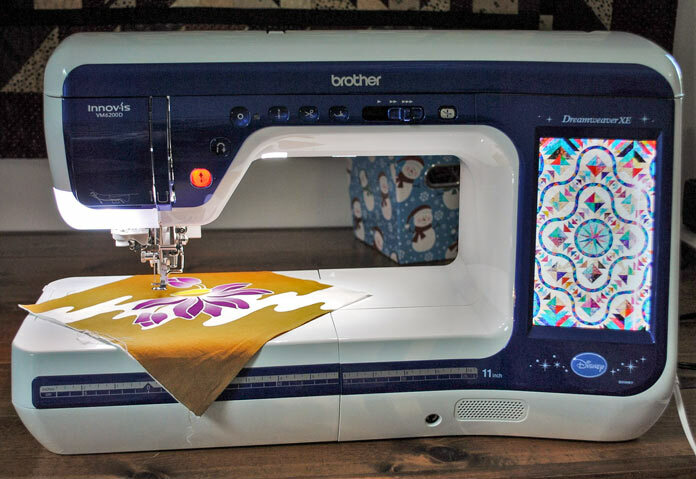 Yesterday on QUILTsocial I showed you how to select from the many amazing Disney embroidery designs included in the Brother Dreamweaver XE. I’ve placed it on the embroidery screen and I’m ready to get stitching. 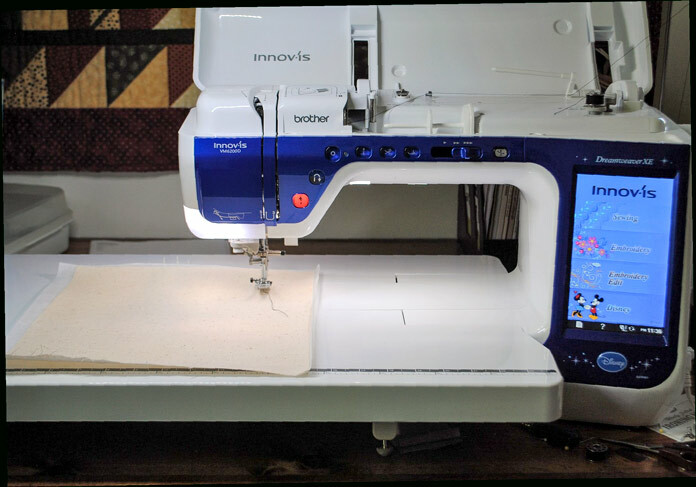 Today I’ll show you 8 features on the Dreamweaver XE that really make machine embroidery a breeze! 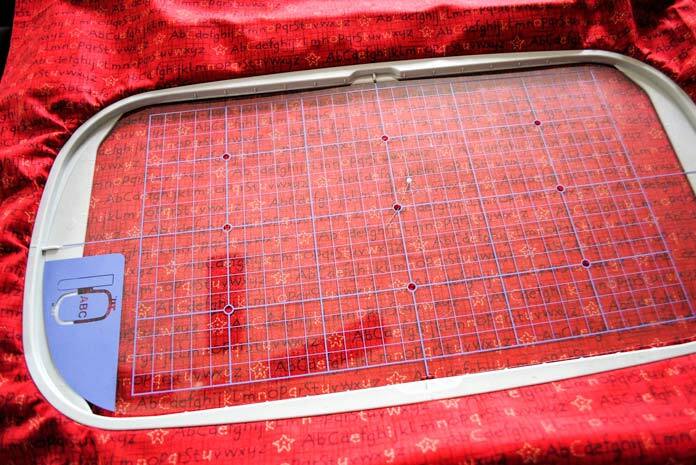 The plastic embroidery sheet that matches each hoop of the Dreamweaver XE helps to align the embroidery design perfectly. I showed you how to use it in my QUILTsocial post on December 21, 2018. Happy New Year! Ever since we were married 24 years ago, we’ve had fabric Christmas gift bags to use for wrapping presents. This year, my two sons who are now 17 and 20, told me how much they liked using the bags since they were so much better for the environment than wrapping paper. Instead of buying wrapping paper at the Boxing Day sales, I decided to get more Christmas fabric and I spent some time making a bunch more bags for next year. That got me thinking about making all-occasion fabric gift bags.